A Mexican-inspired way to enjoy your favorite Jewish soup. My grandfather on my mother’s side, Francisco, whom we called “Yeye,” was wild about chiles. Not very common in his native Bratislava, I guess. He used to say that what he loved the most about his new country was the predictable weather (especially the bright sunny winters), the colorful markets, and most of all, the chiles. All of them. He was oh so very crazy about them, that my grandmother used to hide them from him. She complained that he had no boundaries, no sense of measure, when eating chiles. He simply would not stop. My “Lali” liked to please him though. She had Austrian training in the kitchen and made exquisite and elegant foods. Once in Mexico, she fell in love with the cuisine and learned how to combine the two culinary traditions. She became a master at it. 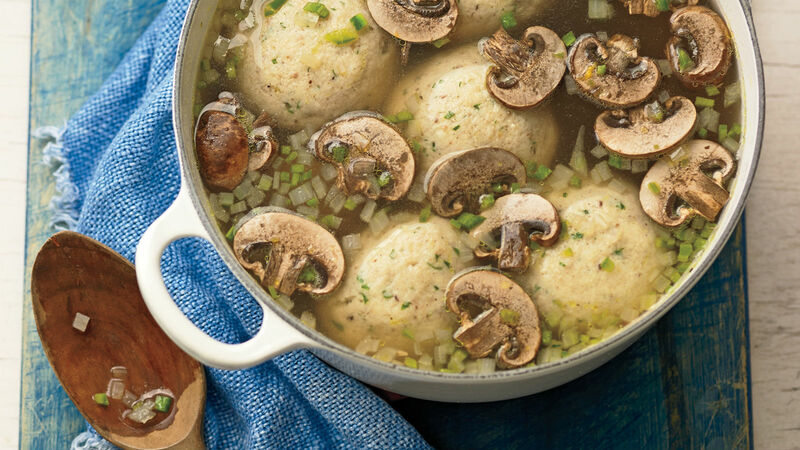 She created a classic dish out of her Mushroom-Jalapeño Matzah Ball Soup. In a large mixing bowl, combine the matzah ball mix, parsley, nutmeg, and 1 teaspoon of salt. In another small bowl, lightly beat the eggs with 1/3 cup of vegetable oil. Fold in the beaten eggs to the matzah ball mixture with a spatula. Add the sparkling water if you want the matzo balls fluffy, and mix well until well combine. Cover the mix and refrigerate for at least half an hour. Bring about 12 cups of salted water to a rolling boil in a large soup pot. Bring heat down to medium and keep at a steady simmer. With wet hands, make about 1 inch balls out of the matzah ball mix and gently drop them into the water. Cover and simmer for about 25 to 30 minutes. Meanwhile, heat a couple of tablespoons of oil over medium heat in a large cooking pot. Add the onion, garlic and chiles and sauté for 4 to 5 minutes until they have softened. Incorporate the sliced mushrooms. sprinkle the salt, stir and cover with a lid. Steam the mushrooms for about 6 to 8 minutes. Take off the lid and pour the chicken broth over the mushroom base. Once it is simmering, incorporate the already cooked matzah balls, without their cooking liquid, and serve. This recipe is shared with permission from Pati’s book Mexican Today: New and Rediscovered Recipes for the Contemporary Kitchen. A grandmother's recipe offers an easy route to this classic Ashkenazi dish. A festive, fried dish to use up that leftover meat and potatoes.